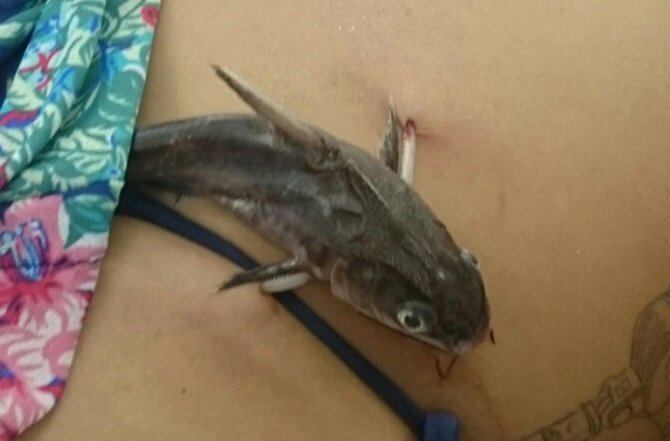 A woman had to have a catfish removed from her stomach after it impaled her with one of its pectoral spines. She had reportedly been swimming at a resort in Sao Paulo, Brazil, when the incident occurred. He explained that the catfish was cut away but the serrated spine was left in her body until she reached hospital. "She was in a lot of pain. We didn’t remove the spine because only a doctor can do this. We took her to hospital so she could have microsurgery. "Generally we deal with people who have stood on fish or have cut a finger touching one, but I’ve never seen a catfish stuck to someone’s stomach. It was definitely a first."